Doctors in the Nepalese capital, Kathmandu, say hospitals are running out of medicines because of a blockade by protesters on the border with India. The blockade has also prevented the delivery of earthquake relief supplies. Ethnic groups from the southern plains, reportedly backed by some Indians, have been stopping supply trucks entering Nepal since September. They are protesting against a new constitution which they say discriminates against them. Nepal produces around 40% of its medicines internally and imports 60% from India. Because of the blockade, Nepal is neither receiving enough new medicine from Indian nor able to produce its own supplies as raw materials have also been prevented from entering the country. The Himalayan nation is already grappling with the aftermath of two earthquakes earlier this year that killed almost 9,000 people and left hundreds of thousands homeless. "Hospitals have run out of essential drugs and supplies, vital social services have been disrupted and aid agencies such as Oxfam have not been able to secure fuel to deliver relief items to prepare people for the winter in earthquake-affected districts," said Cecilia Keizer, head of Oxfam in Nepal. The acting director general of Nepal's Department of Drug Administration, Narayan Dhakal, says he has been asked by the WHO to assess how much medicine is left in the country. The Manmohan Thoracic Centre in Kathmandu has said it no longer has stocks of a number of essential medicines including adrenaline, atropine and saline. Another heart hospital in Kathmandu, Shahid Gangalal Heart Centre, has postponed bypass surgeries because it had run out of the special thread needed to sew up the heart. As well as causing a medicine shortage, the blockade has meant towns and cities across Nepal have run low on fuel, food and general supplies. More than three quarters of Nepal's international trade is with India, and it relies almost wholly on its southern neighbour for fuel. Protesters in the country's southern plains are angry with the country's new constitution which they say discriminates against them because it fails to give them equal representation with Nepal's other ethnic and regional groups. The Nepalese government has accused India of unofficially backing this protest by slowing or stopping completely traffic from crossing the border into Nepal. 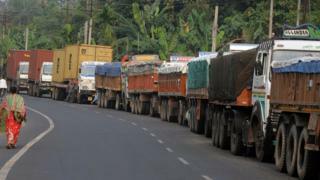 The Indian government has denied this, but has said it cannot allow trucks to enter Nepal while conditions are unsafe. It has also criticised the new constitution and urged Nepal's leaders to engage in dialogue with the protesters.